Good Morning Everyone! I have a really fun and easy sketch this week on my Tuesday Morning Sketches blog. I think you'll enjoy this one. 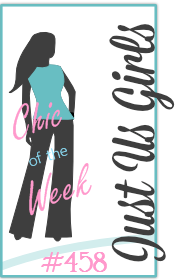 Our sponsor this week is Pixie Petals, a lovely little store dedicated to handmade flowers and ribbons. I have to say that this picture does not do this card justice, it is simply gorgeous in real life... even if I do say so myself. I had wanted Boho Blossoms from My Favorite Things ever since it's release. I finally got it! I scored on the BST thread on Splitcoast Stampers. And then it went into a box. Bad me! So I pulled it out this weekend to play with it and I am so pleased with the results. The lovely flowers and ribbons that were supplied by Pixie Petals set the color pallette and I let me tell you, I am lovin' this! The gauzy ribbon is so yummy. Thank you so much for stopping by my blog today. Now head on over to TMS to join us and to feast your eyes on all the wonderful cards my DT made to share with you. Good Morning! Its Monday so that means a new Happy Monday challenge on Crafting with Deedee's Digis. This week Deedee has a really fun sketch to work with. I flipped it to accomodate the image I chose this week which is called A Light into the World. I don't think I did this gorgeous candle justice, not like Deedee did, but I think my Mom will like it. Every year I hurt myself over planning my Christmas cards. I never manage to make them but I do make cards for my blog and then give them away. This year, they'll be the Christmas cards in the mail. I found a really pretty scrap of Basic Grey paper and it was just enough for the card front. Here's the inside of the card where I used one of the two sentiments that comes in this set. I also pulled out some old punches to continue the holly theme. I hope you like my card and that'll you'll join in the challenge. They're so fun! You are required to use a Deedee's Digis image to participate but her images are so sweet and so affordable - treat yourself today and play along! Thank you for stopping by! Good Morning! I hope you all are enjoying your weekend. I have had an enjoyable weekend. I had so much fun stamping this entire weekend. I got so many cards done, I am thrilled. It's also been a long time since I've posted a Stamps Only Sunday post. I am thrilled to show this card. 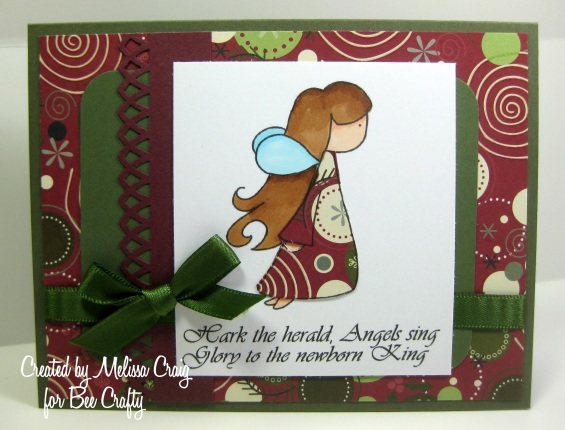 I am excited to give a bit of a sneak peek at one of the images coming to Sweet n Sassy Stamps on Dec 1st. This is Cocoa's Christmas Tree. Isn't he fantastic? I just love Cocoa! He's the mascot for Sweet n Sassy Stamps and watch for news coming about where Cocoa is the star. My card also features the yummy papers from Echo Park - this is the Merry Christmas pack and is available in a 6x6 sampler pack in the SNSS store. The colors are so rich and wonderful. I did use a wonderful sketch from a great new challenge blog that I stumbled across. It's called Sketch Frenzy Friday and you really should check it out. I hope you enjoy my card. I can't wait to share some of the other great images that are coming in December. There's not much time to wait. I hope you have a great Sunday! Thank you so much for stopping by. Be sure you head on over to the SNSS store, all stamps sets and digis are 20% off until the end of November. Good Morning! I hope everyone had a really nice Thanksgiving. We had a really great time here. I even cooked. I was all too happy to just stay in my pajamas all day and get pizza. I told that to my sister and all she said back was "but Miss, you hate pizza!" LOL She's right, its not one of my favorites. Well, I decided I was being selfish so I made a really nice dinner for my Mom, my children and me. I have to admit, it was quite good. The day was beautiful, it was about 80 degrees, the Patriots won and it was just a really great day. So here's the front. Meet the newest release, Josy (5). There are a lot of Josy images in the StampFairy store and this one decided to play in the ribbon. I did follow the sketch from Truly Scrumptous and they had an additional challenge to Think Pink. I love pink and green as Christmas colors, they're so fresh and whimsical and perfect for the Josy image. The card is attached to this cute little gable box that is filled with yummy Lindor truffles. So this created and card and a gift all in one! I hope you like my project and that it inspires you to create unique gifts for your kids' teachers, or your postal carrier or just someone you want to give a little treat to. Happy Friday! Thanks for stopping by. Now head on over to StampFairy World to see the cute little freebie that Gerda has to share with you and then get ready to shop... all images are 50% off!!! And you don't even have to fight any crowds to pick up your favorites. Have fun! Good Morning! I am so excited about a new product that Sweet n Sassy Stamps has in the store. Have you ever heard of Echo Park papers? I hadn't before Korin added them to the store. They are simply gorgeous!! The store is currently featuring 6x6 sampler packs of these rich two-sided papers. You can find them here. So my card for today is all decked out in two of these papers from the Merry Christmas pack. Also featured is Cup of Cocoa, the stamp set that released the first of this month. One side of this paper is the super sweet candy cane stripe. The other side is a beautiful holly berry pattern that you can see a little of on the vertical stripe behind the focal point. I did use the sketch from Card Patterns (sketch #91) to create this card. It was perfect for the Cocoa image. My oldest son is always fussing at me that I never do anything with the insides of cards, so to appease him, I decorated the inside with a simple sentiment that is included in the Cup of Cocoa set. I hope you enjoy my card. I had a lot fun making it to share with you. I will not be posting on Thursday so I wish to take this time to wish you and your family a very Happy Thanksgiving. Even in these hard times we still have much to be thankful for. Good Morning! 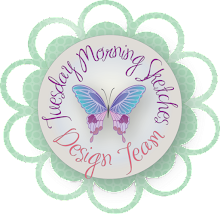 Over at Tuesday Morning Sketches I have a new sketch to share with you and we are joined by a fantastic sponsor Doodle Pantry and her magnificent design team. Be sure to head on over for lots of inspiration and to join the fun. 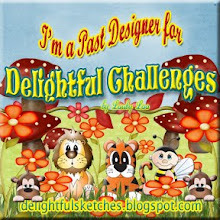 Laurie, the owner of Doodle Pantry, shared some wonderful images with me and my Design Team. This is the card I made using Birthday Birdie - what a wonderful set!! I did make this card to measure 5x7 - having a bit larger of a canvas was a lot of fun. I do hope you like this card and that you'll join us week. Now head on over for the all the eye candy! Good Morning! I hope you all had a great weekend. 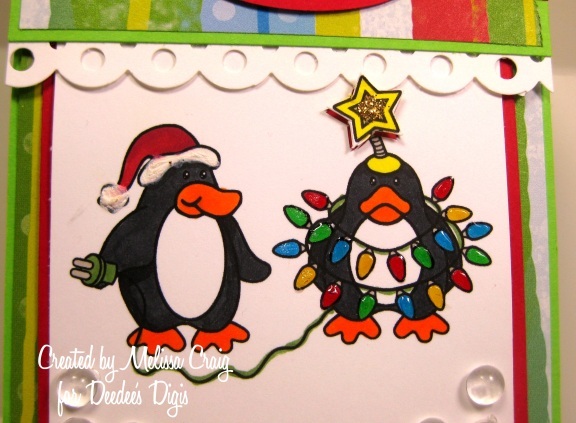 There is a great challenge over at Crafting with Deedee's Digis. This week we're making tags, tag shaped cards, cards that feature tags.... What fun!! So I set out to create another Christmas tag. I also used the sketch from Sketch Saturday which was really fun to use. 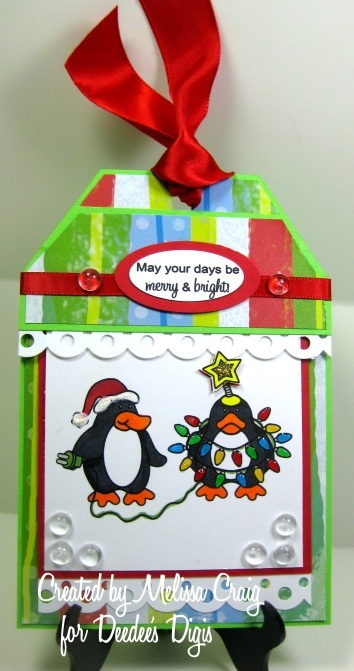 I found a scrap of this funky Christmas paper which I thought would be perfect for these fun-loving penguins that can be found in a set called Merry & Bright. Here's a close-up of the image. Hopefully you can see that I added Diamond Glaze to the light bulbs to make them look like real glass. I also added a touch of gold Stickles to the star for a little more shine. I hope that you like my tag and that it inspires you to join the challenge at Crafting with Deedee's Digis this week. Now is a great time to get started on all the Holiday greetings and package adornments. And if you still have some Thanksgiving/Fall greetings to work on, you're in luck! All Fall digis are on sale for $1 this month only! Have a super day and Happy Monday! Good Morning! I hope you're having a great weekend so far. It's a little quiet around here. My kids were off in different directions but it's time to go gather them up. Saturdays are always so busy around here. My card is featuring the Bee Crafty digi image called Little Lady Skipping and she is just adorable with her flower covered jump rope! I went with a pretty easy design. I did try to embellish it a bit, but no matter what I tried, it simply looked like I was hiding mistakes and that was not part of the challenge. I made an envelope to go behind the focal image from a 6 x 4 1/2 inch piece of decorative paper to pop up the image. The envelope is the perfect size for a gift card. 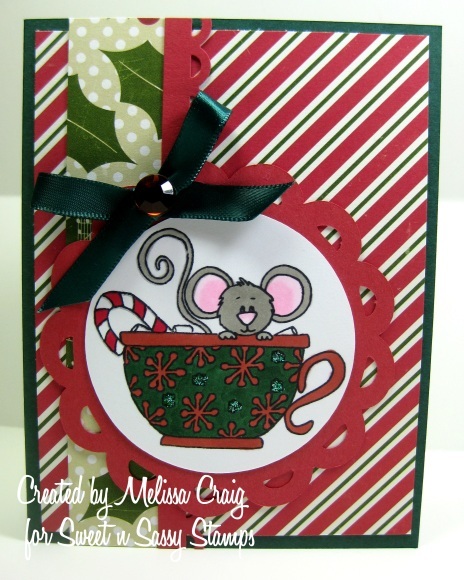 Just pull on the ribbons and the card slides right out. This is great for gift giving since it's a gift card holder and card all in one. I hope you like my card and that it inspires you for easy gift giving. Please join us for this fortnight's challenge, head on over to Bee Crafty to find out how to play along. Enjoy your Saturday!! If this is your first stop on the hop, be sure to visit the Crafting with Deedee's Digis blog, where you will find the directions for the hop, a chance to win the grand prize of a $15 credit to our store, AND a little gift for you! 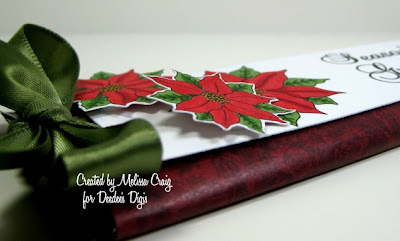 Our assignment for this blog hop was to create stocking stuffers. I went through so many ideas to do for this hop, I cannot even begin to tell you. I decided that covering a chocolate bar, although not a new idea, was the best one to show you. If you have a membership at shopping club warehouse, this is a very economical way to create lots of stocking stuffers that everyone on your list will love. This is also a great idea if you want to create super easy treats for your co-workers. I used the Beauty of the Season digi stamp set. 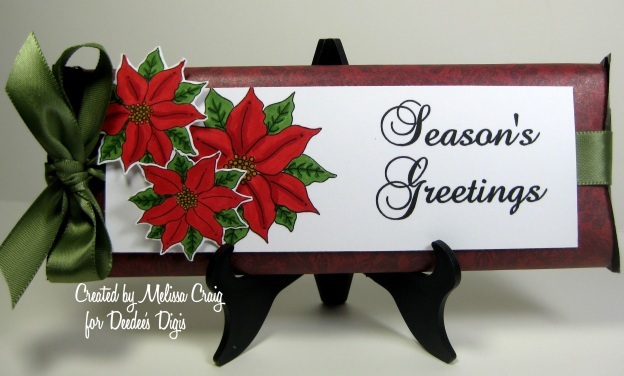 I resized the poinsettia a couple of times so that I can layer, cut out two of them and adhered with pop dots. sure to check back then to see if you've won. Thanks so much for joining us today, and happy holidays to you! Good Morning! I hope you have had a great week. I am looking forward to this weekend and so are the kids. They are off to see the new Harry Potter film with their Dad on Sunday and I have a few hours to myself. Not that I am wishing my kids away or anything, but they've been looking forward to this for a long time. 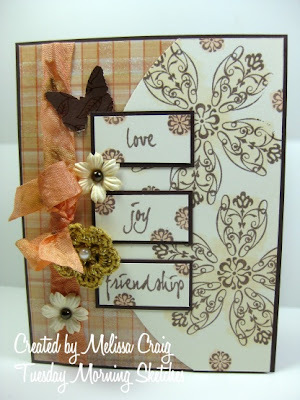 Anyway, its Freebie Friday over at StampFairy and the design team and I are sharing projects featuring the freebie. This is Nelly (5) and she's so sweet. She is so ready to decorate the tree! 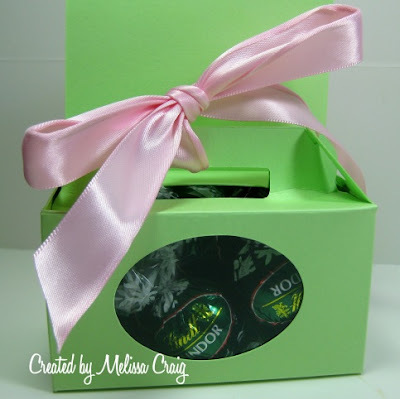 Since we need to think about gift giving, I thought I would make a tag to help decorate your packages. 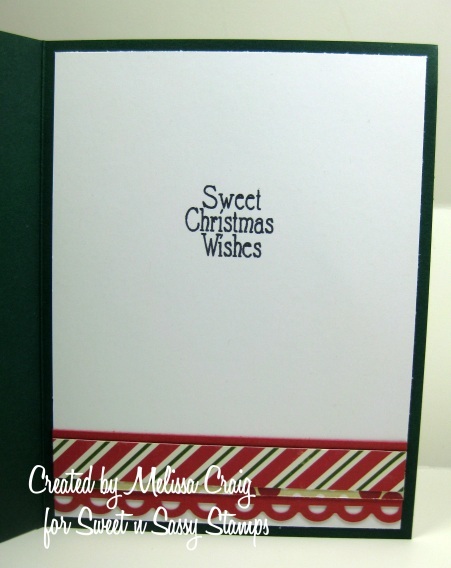 I created a Christmas package tag. The inspiration came from the daily tags photos that I received in my email from SNR for Halloween. So I wanted to create one with a Christmas theme. There is a lot of "mixed" media in my project as well. The digi image of course is the focal point, but I drew the tree (in all it's primativeness) and the presents are a stamp from CC Designs. Here's a close up of Nelly, she is wearing her favorite basic black dress that's been adorned with a pretty white bow. Also her ornament is sporting it's Holiday glitz. The certainly both shine! Good Morning! I am so excited about this week's challenge at Tuesday Morning Sketches. It's a really really fun one. For those who really know me, know that I absolutely love challenge shows on the Food Network. One of my favorite is Cupcake Wars, so while watching one day, I decided we needed to have a cupcake war on TMS. So this week's challenge is all about cupcakes. Whether you want to bake and decorate up some packaging or make cards - the sky is the limit. You just have to feature cupcakes. So I created a box. I tried following the directions I found on the Scor-Pal website, but they didn't make sense to me so I improvised and came up with my own. I also baked red velvet cupcakes and topped them with cream cheese icing. I was going to wrap ribbon around the cupcake but I got so excited to take pictures that it wasn't until after I had cropped the photos that I realized I forgot that ribbon detail. I hope you enjoyed my project and that you join us this week. Have a great Tuesday! Good Morning! With Thanksgiving quickly approaching, I thought this card was appropriate. Although Thanksgiving is not one of my favorite holidays, I do have a lot to be thankful for. Many of you know that earlier this year, my husband of 16 years abandoned our marriage. It was something he longer wished to participate in, pursuing interests elsewhere. I had also been out of job for sooo long. My life was looking rather grim being faced with single-motherhood in a new city/state and searching for a job. Doesn't sound like I'd have a lot to be thankful for, does it? Well, my faith in God and the love of my family and friends I have gotten through it. I did endure many days that were spent crying and sick, but God provided. We still have a roof over our heads and food in our bellies. I was blessed with a pretty good job that I am still learning but is getting easier as the days go by. So, yes, I have a lot to be thankful for. 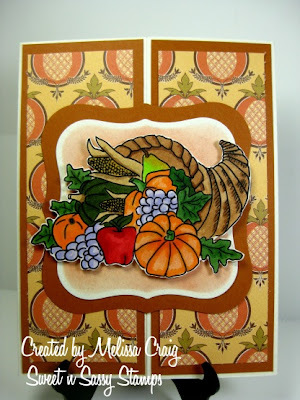 I used the Cornucopia digi from Sweet n Sassy Stamps and the inspiration of this week's challenge at Just Us Girls which is to make a gatefold card. I love this type of card, it's just a bit different than the ordinary and so much fun to do. I have to say that I was a bit intimidated by this image, but once I started coloring I had a lot of fun with it. It wasn't has hard as I believed it to be. Silly me! I do hope that this Thanksgiving season you hug your family and children a little harder and appreciate that they are there, that even though situations may look grim, if you put your trust in the Lord, He will provide. A very hard lesson to learn is: God is never late, He's never early - but He's always on time. We often want our prayers answered in our timing, but remember, He knows best and we often don't. So among the turkey and cranberries and pumpkin pie... the football games, the beyond full bellies and mounds of dirty dishes - give thanks and praise to the One who blessed you with these gifts. Good morning! Happy Friday - I am so excited that weekend is just about here. I was wrong about this Sunday being the day that the kids were going to the movies with their dad - it's next Sunday. Oh well, I still hope to have time to devote to lots of stamping. 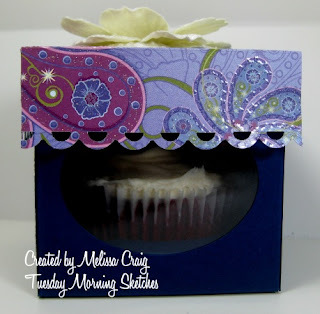 Speaking of stamping, today is the day that StampFairy shares another freebie image. It'll be available until next Thursday and then after that, it'll go into the store. Who doesn't love free!? So I've made a card with this week's freebie image, Jake (7). Isn't he cute? Oh my goodness, one look at this little guy and I was completely in love. I drew inspiration from the sketch featured on Sunday Sketch and Stamp. This is such a great sketch! Remember the card I made last week for a baby's first Christmas, well, this card is for that baby to give to his parents. I think they all are really going to like this. At least I hope so. I hope you like my card. I enjoyed making it to share with you. Thanks for stopping by and now head on over to StampFairy World to grab this adorable image. Lillian please email me at stampedbym@gmail.com so I can send you this adorable image. If I don't hear from you soon, I'll be visiting your blog this weekend. Good Morning! I hope you're all doing well - the week is on the downhill side and I am looking forward to the weekend. The kids' dad is taking them to a movie on Sunday so I'll have a few hours to myself that I plan to dedicate to stamping. My card today is for Sweet n Sassy. 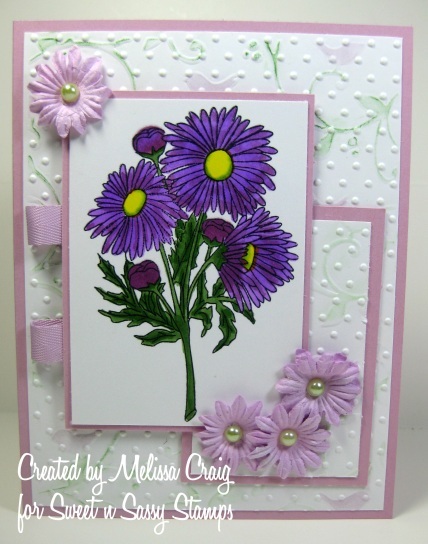 It features one of the new sets that was released the first of this month called November Chrysanthemum. I did follow the sketch from Sketch and Stash which was really fun to work with. My stash part of the challenge is using some card stock from Papertrey Ink that I have had for a long time but hardly ever use. Also out of my stash is the matching ribbon and Prima flowers that rarely see the outside of the bottle. I also used a technique that I believe is called double embossing. I embossed the white pieces with Birds and Swirls embossing folder, then chalked the birds and leaves (chalks that rarely see the outside of it's storage draw, so another stashed item) and then I embossed it again with the Swiss Dots folder. This is a great technique with really cool looking results. Thank you so much for stopping by today. I do love our visits. 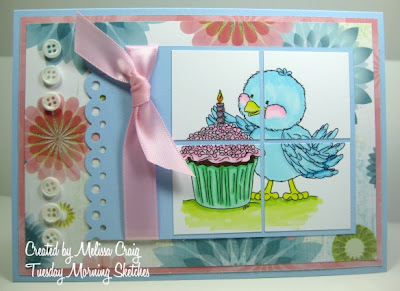 Thanks for hopping along with the Sweet 'n Sassy Stamps Birthday Blog Hop today! If you didn't start at the beginning, you'll want to hop back to the Sweet 'n Sassy Stamps Blog and pick up from there where you left off. We have over 30 amazingly talented ladies participating in today's hop plus a prize at every stop so you really don't want to miss a single blog! It's hard to believe that 3 years ago today Sweet 'n Sassy Stamps "opened for business" with just 4 clear stamp sets being sold on a simple blog. Since then SNSS has grown to over 100 clear stamp sets and hundreds of digital stamps! God has been so good to us! Thank you for joining us in wishing Sweet n Sassy Stamps a very happy birthday!! If you arrived here from Jeanette's beautiful blog, then you're on the right track. If you get lost along the way, you can always return to the Sweet n Sassy Stamps blog to pick up where you left off. Here's the card I made to celebrate this occasion. I used the great sketch from Just Us Girls - talk about a fun sketch!! 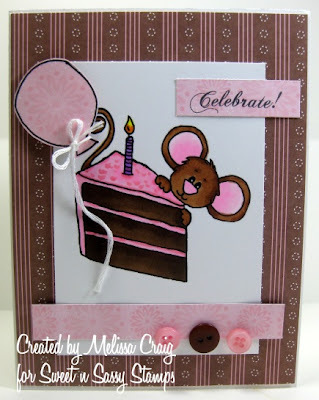 And one lucky winner that comments on my blog will win the adorable Birthday Cake Cocoa image that I used on this card. I hope you're enjoying yourself today as your hopping along. Remember, I will announce the winner here on my blog on Thursday, November 11th, so be sure to check back. 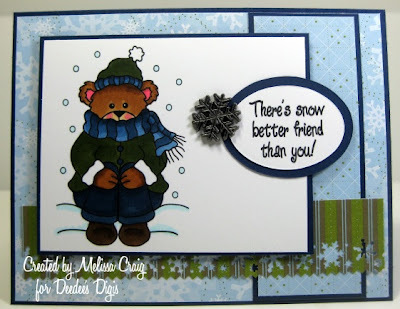 Now head on over to Lisa's blog for more fun and inspiration!! Edit - Thank you participating in the blog hop! It was a true success. Please feel free to leave a comment, I love hearing from you. 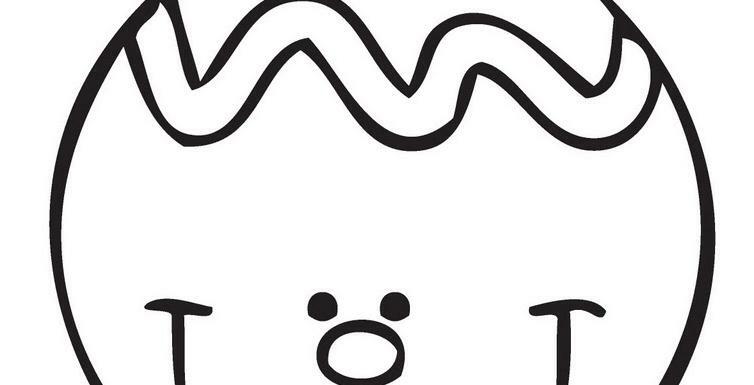 However, the drawing for the Cocoa Birthday Cake image is now closed. Thank you again!! Good Morning! I hope your week is off to a great start! I have a really fun and challenging sketch posted on Tuesday Morning Sketches and this week's challenge is being sponsored by Tiffany Doodles. I had a lot of fun experimenting with this card. 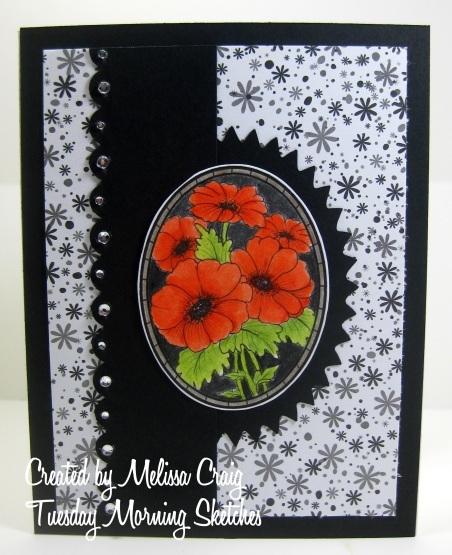 I knew that I wanted to create a card that would allow this pretty Poppies image from Tiffany Doodles to pop. Poppies are one of my favorite things so I really wanted to make them shine. I colored the image with my prismacolor pencils (it was time to dust those off) and then colored the white background of the card stock black so the flowers stood out and to give an idea that this could be stained glass. I also used a fantastic Shaplies from Penny Duncan - it was originally round, but I resized it so that it became an oval. Thank you for stopping by and I really do hope you try out the sketch and join us over at TMS. Have a great day! Good Morning! I hope you had a great weekend. Mine was busy, but a good busy. I think I got a lot accomplished. Part of my accomplishments were cards - I have a Happy Monday card to share with you and it's really Monday. 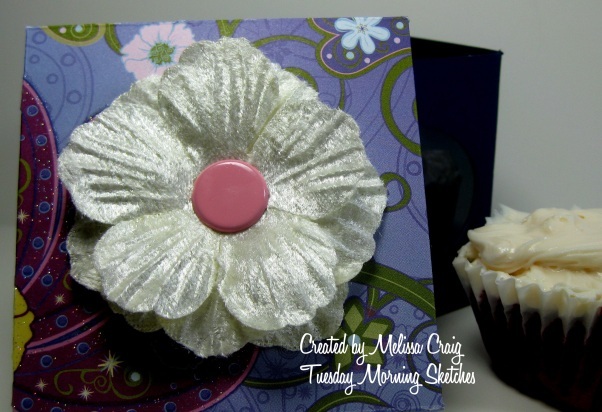 If you don't know about the Happy Monday challenge that happens every week on Crafting with Deedee's Digis, then you simply have to head on over there and give it a try. This week is the Friendship challenge. 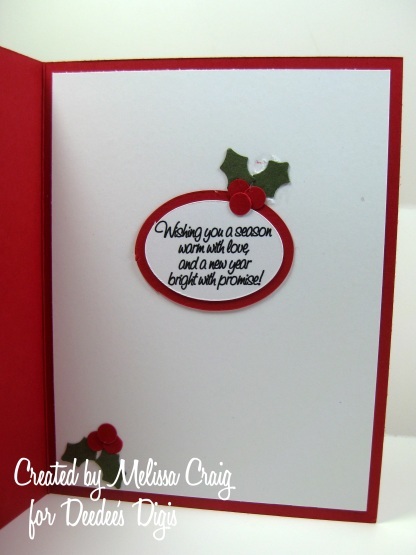 I am so pleased with how this card turned out! I was very inspired by the sketch from The Sweet Stop and also Raise The Bar said to show my curves. I figured the oval sentiment would count as curves. If not, maybe Joni will just like that I shared my card. I think I enjoyed coloring this image the most. You can find it in Deedee's Digis store - it's called Just Chillin' and it's only $3. It comes with 4 wonderful sentiments. 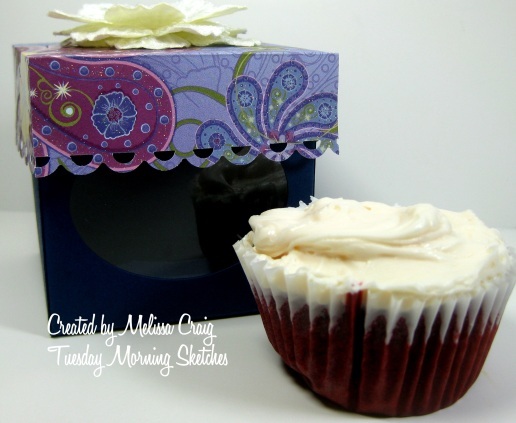 Thank you so much for stopping by and I hope you join us at Crafting with Deedee's Digis. Have a Happy Monday. Hi Everyone! I hope your Saturday is going well. Mine has been a bit of a busy one, but I'm looking forward to an evening of pajamas, a glass of wine and my crafting table. My evening will be spent doing what I like best. 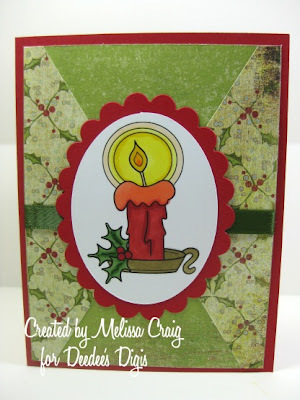 I'm a little late posting today, but here I am to share with you the 2nd Christmas challenge from Bee Crafty. I really love how this card turned out. I found a great (past) sketch from Mojo Monday that was originally featured on 8/18/09. 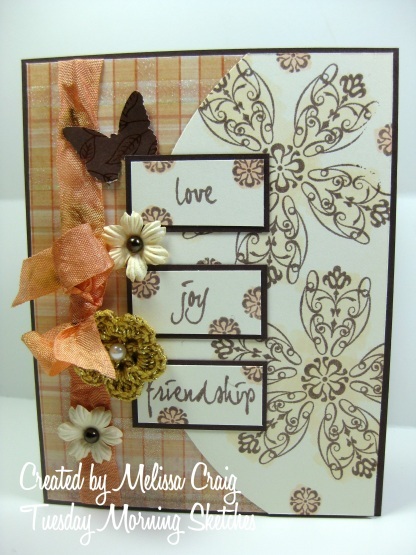 I love the rich colors that I used which were inspired by the beautiful paper that I used. This is Floating Angel Fairy and she's perfect for paper piecing. 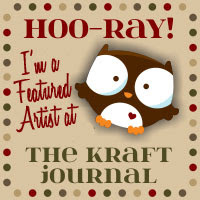 I hope you enjoy my card and that you'll join us at Bee Crafty. You have two weeks! Have a great weekend. Good Morning! It is a Happy Friday - the weekend is here and I hope to get more time to stamp this weekend. No plans yet, so I'll be happy to sit at my table and make cards! I shared with you yesterday that there is a brand new digi-stamp company called StampFairy. This is owned by a sweet young lady named Gerda and the store features so many adorable digis. My dear friend Jackie was contacted by Gerda to help her promote this store and so Jackie set out to pull together a phenominal design team to help spread the word about this Germany based company. So here's my first card with image Santa 4. This is such a cute image and I just love that little moose standing behind this little santa snowman. I keep the card fairly simple as this is intended for a friend of mine. He and his wife recently had a baby and this will be his first Christmas card. I hope you like my card and I do hope that'll you'll visit Gerda at StampFairy. She also has a blog that you can find here. There will be a freebie image offered every Friday but you have to hurry, it's only available as a freebie until Thursday. Enjoy your Friday, thank you for coming by. Good Morning! How are you doing? Well, I had a little bit wind taken from my sails.... now something is wrong with my car. Car problems are my cryptonite - I turn into a big blog of weakness when something goes wrong with my car. Anyway, I am hoping that its tied directly to the recent oil change that I had, I am inclined to think so since I checked the dipstick and there is hardly any oil in my car. Ack!! Anyway enough of my woes, I have some very exciting news to hint at. There is a wonderful new store that will be unveiled tomorrow. The company is called StampFairy and you are going to absolutely love the images the store has to offer! In fact, I'm gonna give you a little sneak peek. Do I have your interest??? Good! My dear friend Jackie contacted me a few days ago and asked me if I'd be a part of this design team. She knew that I had recently stepped down from a couple of teams to lighten my load and she did give me the option to say no, but after I saw these wonderful images, I couldn't resist. 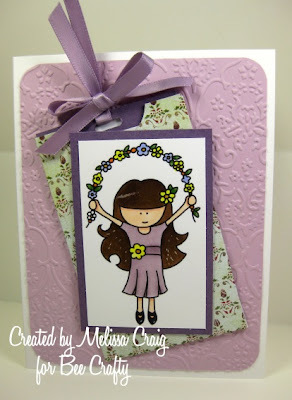 So I am excited to announce that I am a StampFairy Diva, too. 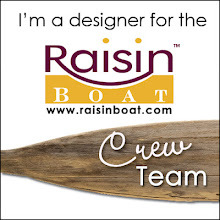 The design team is made up of some uber-talented ladies and I am thrilled that I am allowed to be among them. Following are some really important links that you'll want to check out. Be sure to visit them tomorrow - you're really in for a treat! 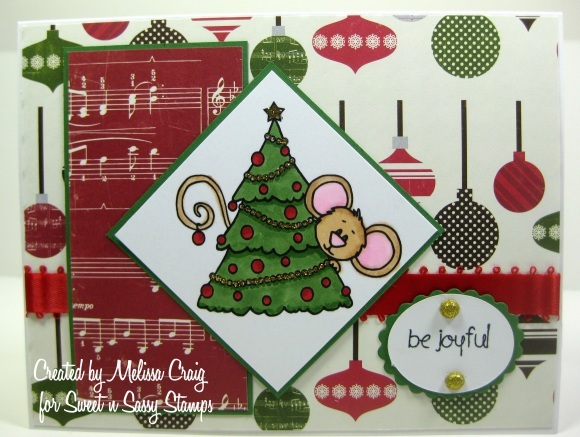 All cards, scrapbook pages, photographs and text are owned by Melissa Craig. I have created the cards and pages with copyrighted material (Papertrey Ink, DRS Designs, MFT Stamps, Hero Arts and many others) and are for personal use only. I share these ideas with you, you are free to CASE the cards but ask that you do not submit for contests or publication. Also, please give credit where credit is due. If you CASE something of mine, please tell others where you got the idea. Thanks!! Happy Stamping and inky hugs. Come join me every Tuesday! And made their Top 3! !